Skardu: Pakistan’s powerful army chief Gen Ashfaq Parvez Kayani contended that India had hardened its position on the Siachen issue, especially compared to the situation in 1989, when the two sides were “close to a resolution”. Speaking to the media during a visit to a high-altitude army camp in Siachen sector that was hit by an avalanche on April 7, Kayani indicated that India had toughened its stance on the issue and there had been “some kind of regression”. He reiterated that there should be “a peaceful resolution of the issue”. “We were close to a resolution in 1989 when Prime Minister Rajiv Gandhi came to Pakistan. It didn’t materialise. I don’t want to go into technicalities. 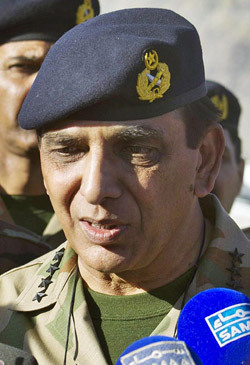 There have been several meetings,” Kayani said. “At the last Defence Secretary-level meeting, there was some kind of regression. Because the term used earlier was authentication but in the last meeting, the Indian side said they want demarcation of the LoC ( Line of Control),” he added. “Having said this, we still have to talk. There is nothing like a peaceful resolution. The best thing is a peaceful resolution but short of that, we will do what we are supposed to do,” the army chief said while responding to questions. In Pakistan, he said, there was support “across the board” for what he had said. This entry was posted in News and tagged Army, Gayari, Gayari Sector, General Kayani, GHQ, Kayani, Pak Army, Pakistan Army, Pakistan military, Pakistan news, Siachen. Bookmark the permalink.